Description: Dioecious perennial herb; rhizome shortly creeping. 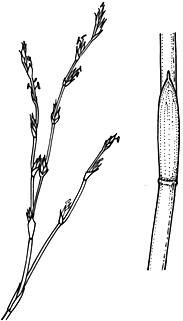 Culms 30–100 cm high, 1–2 mm diam. Sheaths closely appressed, dark red-brown, 0.5–2 mm long, glabrous, apex truncate to acute; lamina absent. Flowering branches erect, straight. Spikelets in both sexes narrow. Spikelets c. 4–7 mm long, dark red-brown, solitary in the axils of the subtending bracts; bracts sometimes nearly as long as the spikelets. Male spikelets several-flowered, ellipsoid, glumes mucronate. Male tepals 6; stamens 3. Female spikelets 1-flowered, narrow-ellipsoid, glumes with longer mucros than male. Female tepals 6; staminodes 3, minute. Distribution and occurrence: in sandy, usually shallow soils, often poorly drained or in successional stages over sandstone rock surfaces; from the Budawang Ra. to Gosford.